"41 JMP and .357 AMP "Case Forming Die Sets." A forum member and I were discussing these case form sets when several questions arose about the trim dies in the die sets. I assumed that the "Trim Dies" in these die sets would be the same as the .44 AMP trim Die. I believed that you would create an un-reamed piece of .44 AMP brass with the trim die and then use the "Ream Die" to size down the case before the reaming. I have these two case forming die sets but have never used them. I looked at the trim dies in the two die sets and I was flabbergasted at what I found. The two trim dies are caliber specific and both perform a necking operation. It turns out that in the "old days" you would first use the supplied trim die to neck down a .308 or 30-06 case to the correct dimensions and then hacksaw the excess. This must have required some brute force to neck that much brass just to cut it off. The posted picture shows this operation. The word goofy comes to mind. You got me thinking though and I found the instructions below for the .44 form die set..THEY recommend trimming then forming! The 357 reams through the neck. The 44 has a stop to only ream so deep. It's a lot of work. You can cut the 357 308 case off first, but if you can't cut it nice and square, it's probably better to do as the pics. I could see the jagged cut not going well. I think these were setup to form through the ream die, cut off with a hacksaw slightly long and file to top of die. And if you have a rockchucker and use imperial sizing wax, it's not as hard as one would think. But it's a lot easier buying starline brass. Lol yeah. I did it just to say I did it but I won't don it again if I can avoid it! Apparently all case-forming sets form the case through the form/trim die. That is the first step in the instructions above. It says to ‘use’ that die, which means ramming a case fully into it which shapes it. Then you cut the protruding end off, then file it flush with the top of the die. The second step is then to use the ream die to ream the neck of the case. These dies are cartridge-specific and the reams have a stop which ensures the reamer only extends so far into the mouth of the case. The ring at the top rests against the top of the die, but the bottom of the case is far below that, right? 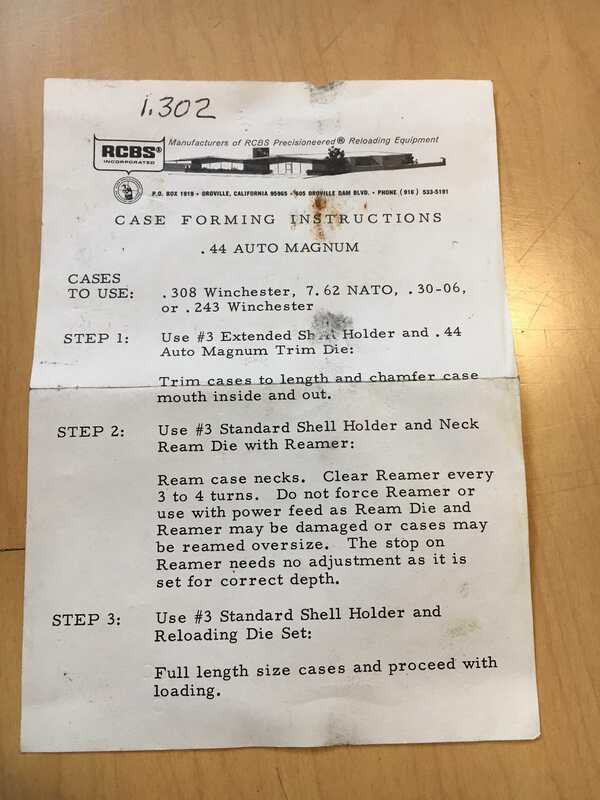 I would assume the reamer only penetrates the case 1/4 inch or so? What would be illustrative would be to picture the reamer alongside the die, with a case alongside them both, to give the appropriate perspective? I will say that when I was forming my 44 brass (pre Starline/Quality era) the neck reaming was the most challenging, even with a long tap handle it would wear you out with 50 rounds. I do not plan on doing that again, I have used many of the Starline brass for 357 and it works just fine. 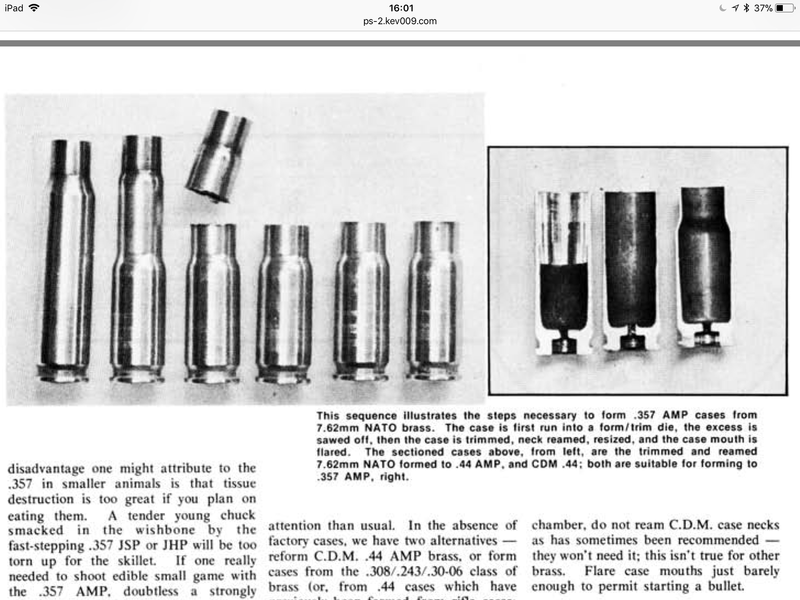 As for the 44 stuff I ran with the forming set out of 7.62 blank I think it may not wear out before the gun does. 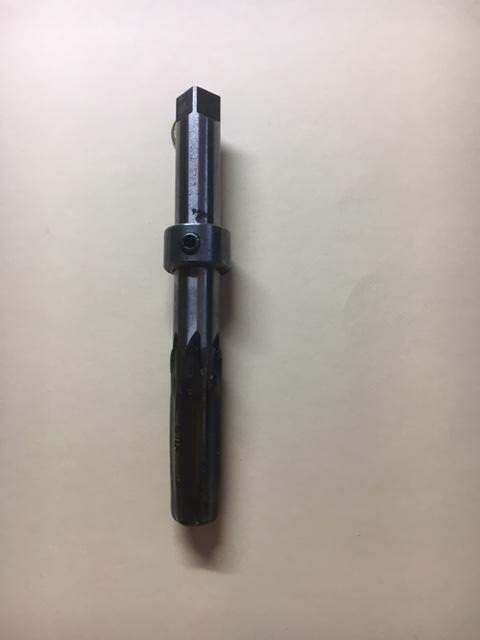 Monday I asked rcbs.com-ASK RCBS to send me a copy of the instructions that they (RCBS) would have included with the .41 JMP and the .357 AMP case form sets. Today, Wednesday, an unidentified person at ASK RCBS sent me the attached copies of the instructions I asked for. Three cheers for customer service ! Looks like the .41 instructions call for sizing from .308 or .44 Auto Mag cases. The .357 instructions only call for using .308 cases to form from. "My apologies to Bruce for sticking my nose in his thread and so I'll start my own." No problem at all. I was starting to think that you had to say happy-birthday to get any response.